This has been one of my favorite series to come out in a while because I love Greek mythology so much, first, and second because I love the story that Aimee Carter has created in this series. It's unique to Greek myth, brings something fresh to these old tales, and it is all about Hades who, as you know from prior posts, is my favorite Greek myth god. 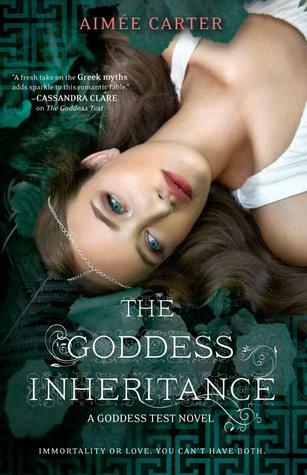 The Goddess Inheritance was a perfect ending to what has been a wonderful, entertaining series. The characters are just as intriguing, loveable, and unforgettable as always. I loved the new closeness that the reader gets to witness between the Greek god family. Up until this book, we've seen them but never really got to know them thoroughly. In this book, a great portion of the story is lent toward building those relationships, integrating Kate into the group, and working as a team to defeat Cronus. I loved this aspect of the story. The story itself was exciting and suspenseful. Loved the fighting! Also, it was probably, at least to me, the most emotional of the three books, which gave it a greater depth and invested me even more thoroughly into events and their outcome. There was a really good twist that, although I suspected it, was still a bit of a surprise to me. Aimee Carter has created an amazing world here, and her storytelling made it come alive. All in all, this is one of the most beloved series I've read in the last two years. This book was an amazing and had a rather perfect ending to round things off. My only regret is that it's now over, but I know I will be rereading these books for years to come. I cannot wait to get my hands on this book!!!! Jessica it is definitely worth the wait! !